Mayor Bill de Blasio may have diverged from his predecessor’s path several times in his first year in office, but when it comes to tourists, he has embraced Michael R. Bloomberg’s rallying cry: Keep them coming. Mr. de Blasio increased the city’s spending on tourism promotion in 2014 and is considering doing so again this year, said Alicia Glen, a deputy mayor. City officials are expected to announce on Monday that the official count of visitors to the city last year was 56.4 million, up from the previous peak of 54.3 million in 2013. The influx of tourists has been growing steadily since the recession ended, consistently surpassing the goals set by city officials. The impact of tourism on the city’s economy has been increasing too, but not as fast as projected. NYC & Company, the city’s tourism promotion agency, estimated that tourism spurred $61.3 billion in economic activity last year, far from the pace needed to reach its goal of $70 billion annually in 2015. Much of the discrepancy can be explained by shifts in the global economy, said Fred Dixon, the chief executive of NYC & Company. A weak American dollar had drawn hordes of shoppers from Brazil and other countries where tariffs make goods more expensive. Brazilians, who make up the third-largest contingent of foreign tourists, had developed a reputation for filling suitcases with purchases of clothing and everyday items. Now, with the dollar’s rebound diluting some of the buying power of foreign currencies, city officials are banking on drawing more visitors from less-tapped sources, especially China. City officials estimate that more than 740,000 visitors came from China in 2014, almost five times as many as in 2009. China passed France last year to move into fourth place as a source of foreign tourists, behind Britain, Canada and Brazil, tourism officials said. Already, the Chinese are the largest contingent of foreign visitors to the Metropolitan Museum of Art, said Emily Rafferty, president of the museum and chairwoman of NYC & Company’s board of directors. “They’re definitely the No. 1 visitors to us and we predict it’s growing,” she said. A recent rule change that will extend visas for citizens of China to 10 years from just one should fuel a continued surge of tourism, Mr. Dixon said. So far, Mr. Dixon said, the bulk of the Chinese visitors have come in groups that sweep through New York and a few other American cities in rapid succession. But a new group of wealthier Chinese tourists, who spend considerably more on luxuries, is emerging, he said. The Chinese tourism target of the future “is going to be the higher-spending, longer-staying, upper-middle-class and luxury market,” Mr. Dixon said. In contrast to Brazilian visitors, he said, the Chinese tend to shop for more expensive items, like watches, to take home as gifts. Ms. Glen said that diversifying the sources of tourism as a hedge against economic slumps in particular countries or regions is one aim of the de Blasio administration. “We don’t want to be too reliant on any specific place,” she said. NYC & Company is nearing the end of a five-year contract with the city, which supplies about one-third of its funding. The rest comes from the hotels, museums, restaurants and other businesses that make up its membership. Ms. Glen said the city gave NYC & Company an additional $1 million last year, on top of its base allocation of about $12 million. She said city officials were still discussing how much additional money to give the agency in the coming year. To enhance New York’s all-American allure, NYC & Company selected Taylor Swift, the music star, as the city’s unofficial — and unpaid — ambassador last fall, a choice that went over as well with some New Yorkers as Mr. de Blasio’s use of a knife and fork to eat pizza. “The thinking behind choosing Taylor was igniting a new conversation,” Mr. Dixon said. Plus, he said, Ms. 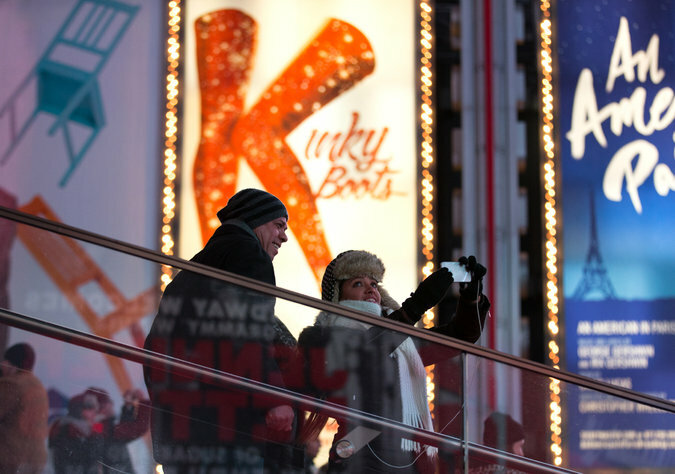 Swift, who moved to the city last year, performed her new song “Welcome to New York” on national television from Times Square on New Year’s Eve. The dividends from having “the biggest pop star of the moment” do that will be rolling — and flying — in for years to come, he said.